Interactive magically moving ball. Catch it if you can! Built-in motor activates to make the ball roll around, promoting crawling. Limited controlled movement means that the ball stops within reach. Press the chunky buttons to hear fun music and animal sound effects. The Crawl and Learn ball helps introduce animals, numbers, counting and colours. Motorised ball magically rolls on its own. Turning ladybird key spins the top disc and activates melodies. Animal press-buttons introduce animals and their sounds. Light-up shape buttons introduce colours, shapes and 1-2-3. Includes ribbons for tactile stimulation. General information: Size H19.1, W20.3, D17.8cm; For ages 6 months and over; Batteries required: 3 x AA (included); EAN/MPN/UPC/ISBN: 50803473532. WARNING(S): Only for domestic use. * . 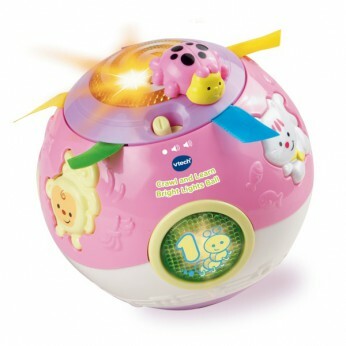 This toy costs approximately £15.99 (for the latest and best prices make sure you check our retailer list for the VTech Crawl and Learn Bright Lights Ball (PINK) above). In our review of VTech Crawl and Learn Bright Lights Ball (PINK) we classed it as being suitable for ages 1 to 3 years but recommend you check the manufacturer specific advice before purchasing.